The restaurant chain is showing signs of recovering from its nightmarish start to the year — after a string of high profile food poisonings — left it without customers. 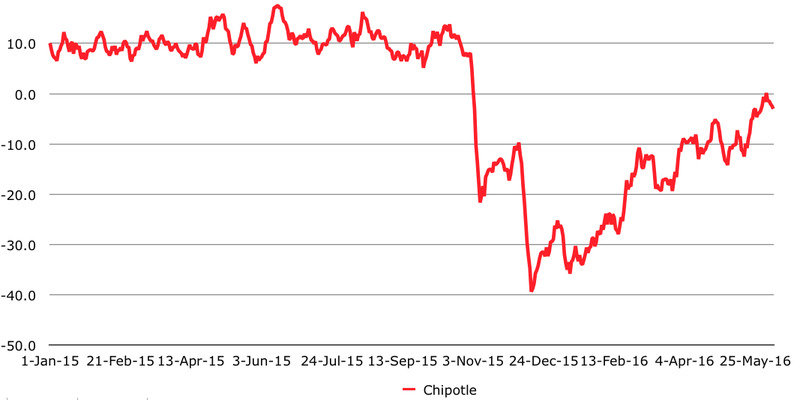 Surveys of customer perception, and data on foot traffic at the chain indicate that Chipotle’s business is picking up. It’s early days, and not yet clear how much this is a product of an aggressive promotions, but June 2 poll of consumer perceptions by YouGov revealed positive feelings for Chipotle. That was soon after the first outbreak of E.Coli poisoning. By the time it was all over — regulators gave Chipotle an all clear in February of this year — 55 people had been sickened after eating at Chipotle locations in 11 states, and sales were in free fall. In the first quarter, revenue plunged and the shares have crashed from pre-crisis levels. 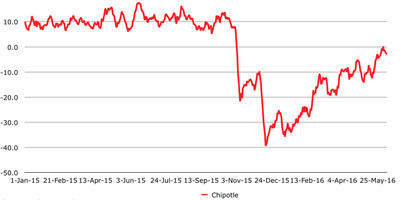 YouGov BrandIndexYouGov BrandIndex has measured Chipotle’s ‘Buzz score’ daily, since January 2015. As perception improves, there’s also signs that ustomers are returning. 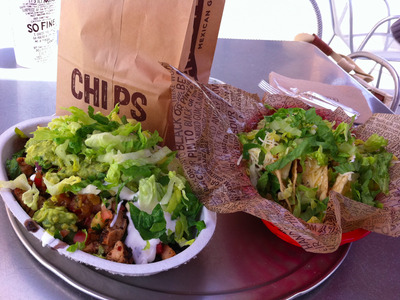 While Chipotle declined to provide any data on foot traffic or sales, holding out till the company’s next quarterly earnings report in July, location-based marketing company xAd revealed that Chipotle’s share of foot traffic is growing compared to Taco Bell. Anecdotal evidence of Chipotle locations once again filling up with lines have been published in Seeking Alpha, appeared on social media, and observed in Business Insider’s own visits to New York City restaurants. 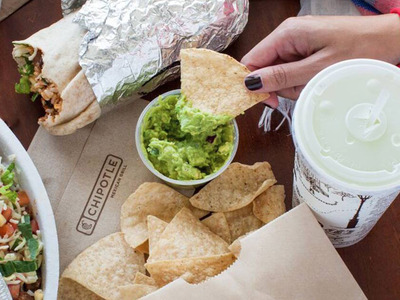 This is the first time in a year Chipotle’s been busy…what the hell? Since February, when the crisis was declared over by federal investigators, the company has focused on implementing preventative measures to make sure the chain never faces a similar crisis again and promotions to bring customers back to the chain. 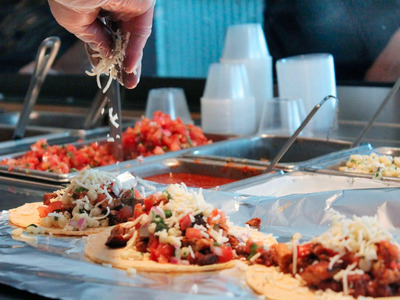 Chipotle has rolled out new safety measures and hired food safety experts to guard against further health scares. The company spent $70 million on promotions, something that contributed to the drop in sales in the first quarter. 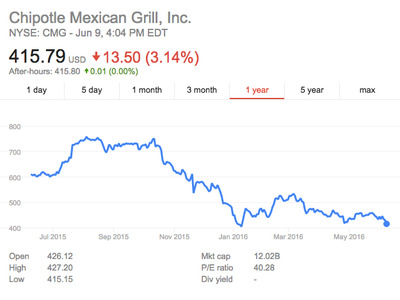 The changes did not immediately have the impact Chipotle would have liked. In April, Chipotle reported that comparable-store sales, or sales at locations open for at least one year, fell nearly 30% in the first quarter — an even greater loss than analysts had anticipated. told investor social network SumZero, last month. While some investors, like Tseng, are convinced of Chipotle’s comeback, many investors haven’t yet noted the rise in foot traffic and growing positivity from customers..
Chipotle stock was trading at $415.79 when the market closed on Thursday, still well below their levels before the outbreak. The stock’s all-time high of $758 was set last August. There are still many questions as to when Chipotle will return to its previous heights — if ever. Menu fatigue may ultimately be a bigger problem for the brand than E. coli. According to analysts, chain’s simplistic menu contributed to to sales growth contracting even before the outbreak, which emerged in the fourth quarter of 2015. The comeback is proving costly as well. The company spent roughly $70 million on promotions between February and May 15 — about 16% of Chipotle’s total sales last year. Even as the promotions shift to by-one, get-one offers, and with the hope that customers continue to come back and actually pay for burritos, that’s a lot of money to earn back.